Over the last 25 years, Stephen Kenney has built more than a dozen marquis housing properties through North Carolina and the southeast, while also developing a reputation a well-known leader in the realty and development industries. Prior to founding what are now collectively called The Kenney Companies, Mr. Kenney was known foremost as a professional football player. A proud Dean’s List graduate of Clemson University, Mr. Kenney was named ACC All-American and later inducted into the Clemson Hall of Fame. After moving on from his beloved Tigers, Mr. Kenney played 8 years as an offensive lineman for the Philadelphia Eagles and the Detroit Lions. The Eagles’ honored him as a finalist for their 75th Anniversary Team. In founding Kenney Properties, and later Kenney Realty Services and Kenney Development, Mr. Kenney surpassed his acclaim as a professional athlete and built a lasting legacy. Today, the Kenney Companies control the entire process of developing, building, owning, and operating its apartment communities. As Senior Vice President for the Kenney Companies, Jere serves as the chief executive under Mr. Kenney and is directly responsible for management and oversight of the property management division and its team members. 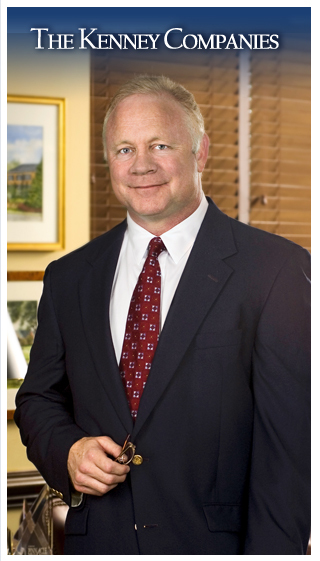 Jere adds degrees from North Carolina State University and The Wharton School to his more than 30 years’ experience in property management. A Certified Property Manager (CPM), Mr. Buch previously received the prestigious “CPM of the Year” award from the Institute of Real Estate Management. As Human Resources Manager and Office Manager, Crystal is responsible for finding and attracting the highest quality staff across the Kenney Companies’s 12 properties and 3 divisions. Crystal adds to her 10 plus years of human resources experience degrees from both East Carolina University and Strayer University. At the latter, she received the Strayer University Medal of Honor for maintaining a 3.9 GPA while pursuing her MBA. Lastly, Crystal is certified by the HRCI as a Certified Professional in Human Resources (PHR), and is an active member of the Society for Human Resources Management and Raleigh-Wake Human Resources Management Association.